I’m very pleased to introduce Diane Voltin who is serving as guest author for this month’s installment of This Month in Oregon Woman Suffrage History. Ms. Voltin was a student in Janice Dilg’s Winter 2012 capstone course at Portland State University titled Monumental Women. In the course students developed a walking tour of Portland that highlighted people and places important to the 1912 suffrage campaign. Ms. Voltin is a 2012 graduate of Portland State University with a degree in Social Science and with interests in history and geography. In the following selection, Voltin invites us to consider the ideas and tactics of Eva Bailey and other Oregon women who opposed woman suffrage. She raises important questions about the nature of women’s relationship to the state and to citizenship as she investigates Bailey and other anti-suffragists in the 1912 Oregon campaign. She also gives us a glimpse of the sparring between supporters and opponents with a wonderful rebuttal of Bailey and the anti-suffrage position from Abigail Scott Duniway. The issue of temperance played less of a role in the suffrage fight in the 1912 election than it had in previous elections, but the “liquor interests” still loomed large concerning the issue. This letter to the editor of the Oregonian, signed by the elected title-holders and members of the Oregon State Association Opposed to the Extension of Suffrage to Women, refuted the claim made at the Women’s Christian Temperance Union convention that men who sold liquor had anything to do with the writing or distribution of an anti-suffrage pamphlet. While some women in Oregon were unwilling to have the vote “imposed” on them, women such as Eva Bailey, president of the Oregon State Association Opposed to the Extension of Suffrage to Women, demonstrated the ability of women to influence the political process in Oregon. 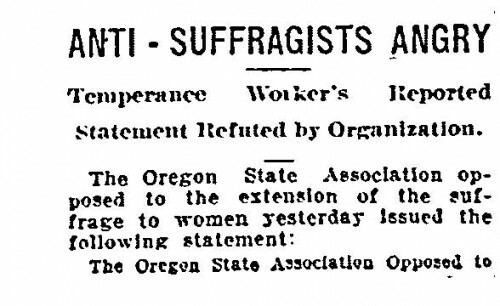 “Anti-Suffragists Angry: Temperance Workers Reported Statement Refuted by Organization,” Oregonian, October 24, 1912, 4. The Oregon State Association Opposed to the Extension of Suffrage to Women was the organized and public face of the anti-suffrage movement. Their argument against granting suffrage to women in Oregon, as detailed in the 1912 Oregon Voter’s Pamphlet, was based on the belief that woman, “has done her part in the home and not on the hustings, and her power for good is the greater because she has been content to be a woman and has not striven to be an imitation man.” (Oregon Secretary of State, Voters Pamphlet for the General Election, 1912 [Salem: Oregon State Printer, 1912], 7.) Anti-suffragists cautioned that granting the vote to women might give women the appearance of being more like men on a surface level, but stressed that doing so should not be confused with actually making women equal to men, which anti-suffragists considered a fundamental impossibility. The anti-suffrage movement also argued that the ability to vote was a duty, not a privilege, and that the household, not the individual, was the unit of the state, negating the need for married couples to vote individually, as the man’s vote represented his entire household.